The ConEd building is a historical landmark so the exterior masonry, etc. cannot be modified. The interior is very modern, however. BreakerBot sits on a sofa in the lobby. Group photo after the presentation. We demonstrated these functions for them with our prototype, and we had a long conversation about the technical and logistical constraints that would need to be considered and accounted for in a full scale robot. As for sealing ConEd's commitment for next year, we are still working on the business aspect of the deal and that's really all I can say right now. We did leave BreakerBot there so that it could be used to help secure funding for the project from the higher-ups who were unable to attend our presentation. It was hard to say goodbye to BreakerBot, but we are very happy to know that BreakerBot has a new home at ConEd. Always use vector image formats (PNG, TIF, etc.) to ensure crisp resolution at any scale. 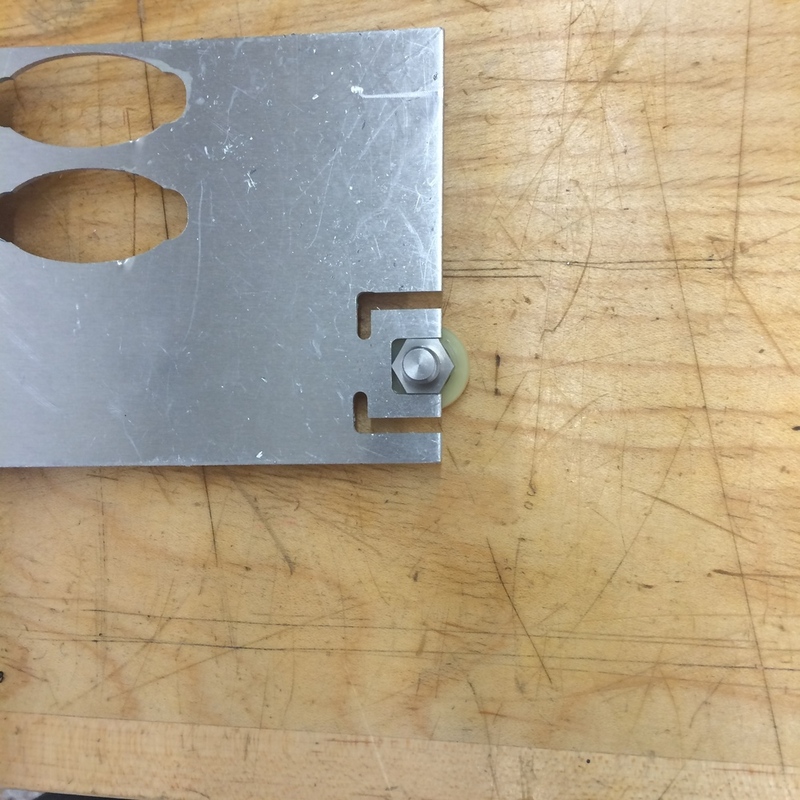 Even though our senior design class is technically over, we still have some things to finish with our project. We are traveling to my hometown of New York City to give a presentation and demonstration of our robot at ConEd. The goal of this is to convince them to continue future phases of the project at BU to design and build a full scale version of the robot. We spent the day trying to make our robot look a bit more professional and presentable by adding lasercut acrylic plaques of our sponsors' logos. We also turned some aluminum standoff spacers that I think add a really nice touch. +Y translation + CW rotation. Notice the skidding. If the X vel. were +, the motion would be correct. I hadn't fixed the wheel angles at this point though; those are still wrong. Pure translation in Q1. Notice the X velocity still seems to have the wrong sign. This looks correct, but it's not. If you try gradually reducing the rotation and keeping the translation the same, you'll notice something wrong. It's helpful to test limiting cases like this, by introducing things very slowly. I stopped doing the motion plots and just did a single snapshot with velocity vectors. You have to adjust the sign of the wheel velocity to get the vector pointing in the right direction. Here you can see all the wheels have the same velocity [vector] as each other, and as the body of the robot. Bingo. Here's where I started trying to combine translation inputs and rotation inputs. Here the robot has a Y+ translation and a CCW rotation. 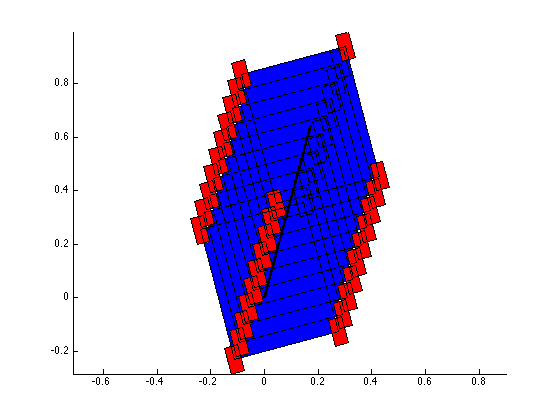 The net result is a pure rotation about some point on the X axis. Now I'm combining X and Y translation with rotations. I repeated this for different quadrants (translation) and different rotation directions (CW,CCW). You can see that the lower left wheel is on the largest radius of the orbit, and it has the highest speed. Good sign. I went through each translational quadrant twice, one for each rotation direction (CW,CCW). One other verification I could do is making sure the normal lines from each wheel intersect at the same point. 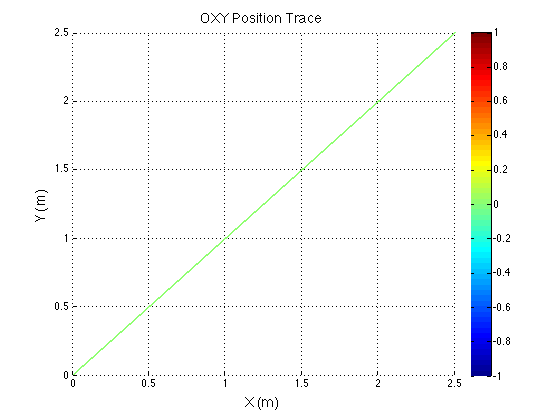 This is the orbital point I mentioned in the text below. Our team finally got the robot moving and steering! 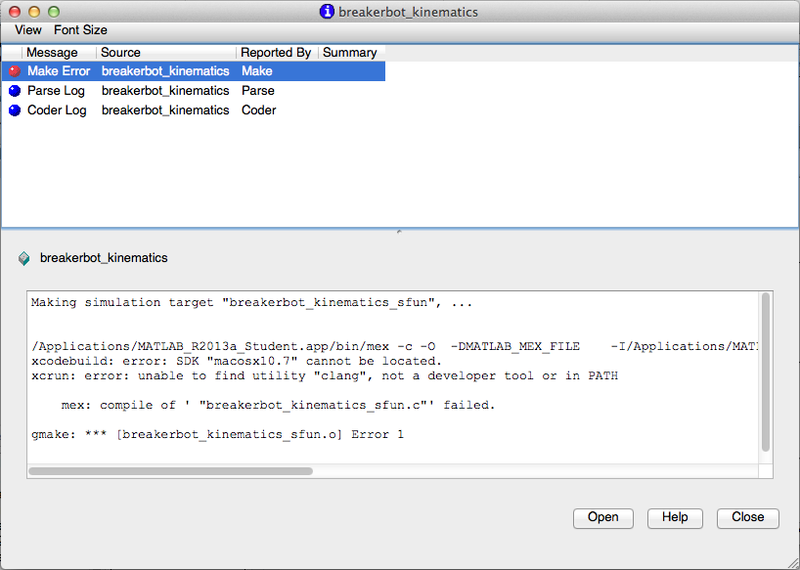 Which means it's finally time for me to start the implementation process of the kinematic and control equations. To further verify and help prepare for the implementation, I made a little simulator in MATLAB to help visualize how the robot will move given certain (steady state) commands. Transient commands are a whole other issue, which I may discuss later. The structure of the top level code is simple. It defines the parameters of the robot and of the simulation, and calls the swerve_command function. 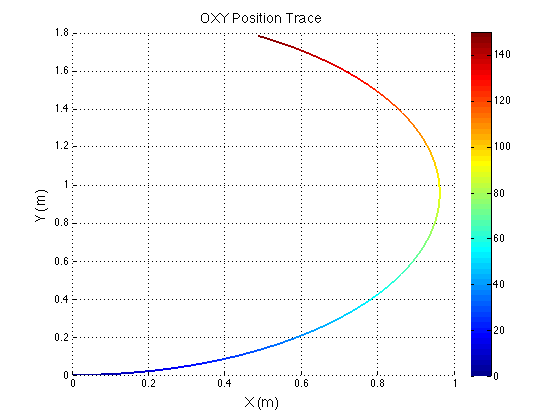 This function performs the inverse kinematics and spits out the wheel angles and speeds, as well as the position (x, y, theta) information for that time step. Over several time steps, the robot will move. 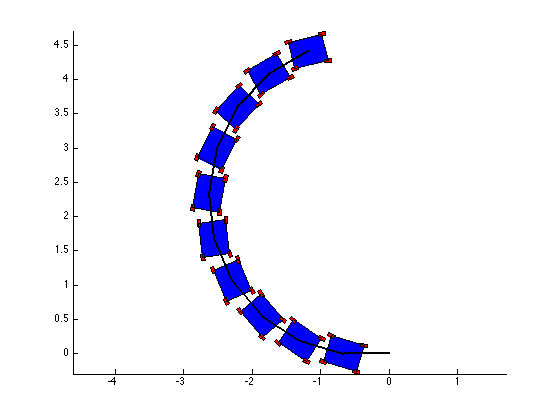 If steady state inputs are held, the wheel angles and speeds will remain constant, even if the robot itself is executing some curvilinear motion. The robot is plotted at each time step. To verify the wheel angles are correct, you need to visually confirm that the wheels are tangent to the path taken by the wheels in each snapshot. Confirming the wheel speeds is more difficult. For any type of pure translation all the wheel speeds just need to be the same. This has been confirmed. If there is any type of rotation involved, the wheels will orbiting some central point. If the location of the point is known, then the radius to each wheel can be found and using the omega = v/r equation you can confirm that all the angular speeds about that central point are equal. This is hard to do currently because we are normalizing all our speeds because they are simply throttling values which will be sent to the motors. We do not know exactly what speeds they will spin at. However, the ratios of the speeds are telling. What we know is that the wheels on the largest radius of the orbit must have the highest linear velocity, and the wheels on the smallest radius of the orbit must have the smallest linear velocity. 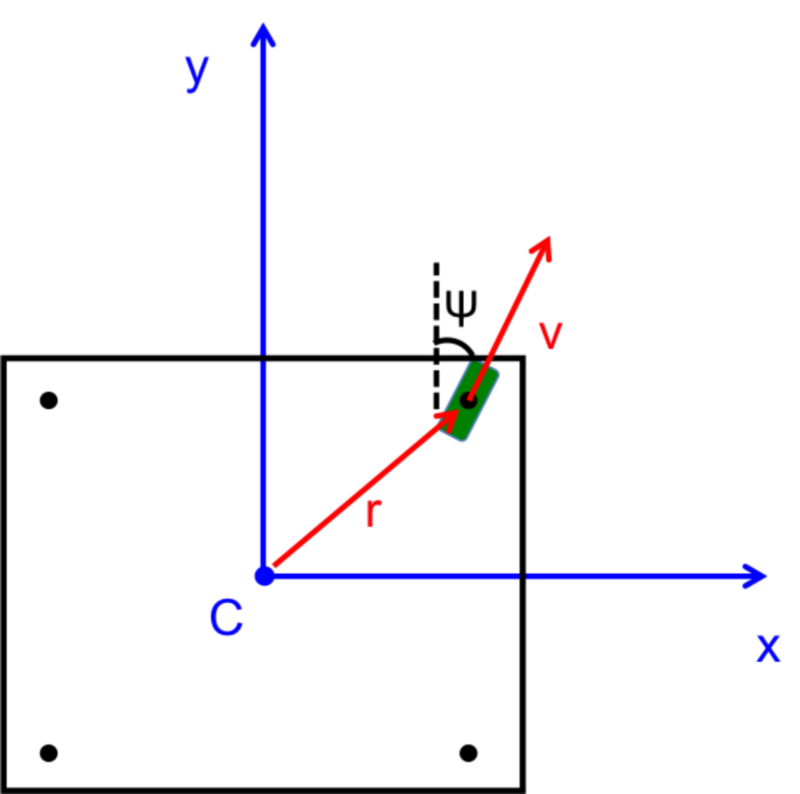 This allows all the wheels to have the same angular velocity around that central point. As you can see from the photos, this phenomenon is evident by the colored velocity vectors. There is something funky going on with the way that the motion of the robot is plotted. 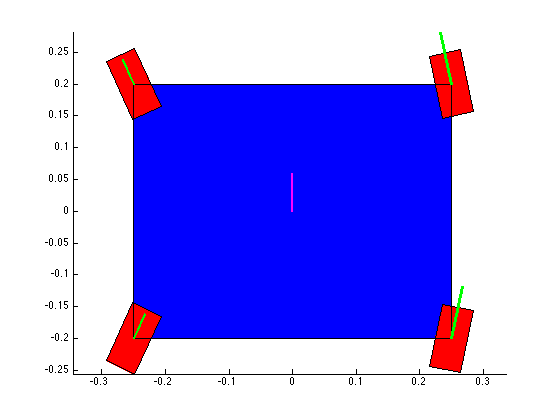 The wheel angles and speeds look okay, but when I try to plot the motion some of the components of the motion (X and rotation) have the wrong sign and it looks like the robot is skidding across the floor. I haven't been able to figure out why that is yet. I have a feeling it's some kind of sign error but I haven't found it yet. I discovered a few minor issues with my previous derivation. I had not converted the unit vectors from one frame to the other correctly, and I left some of the expressions in the unit vectors of an inappropriate frame. 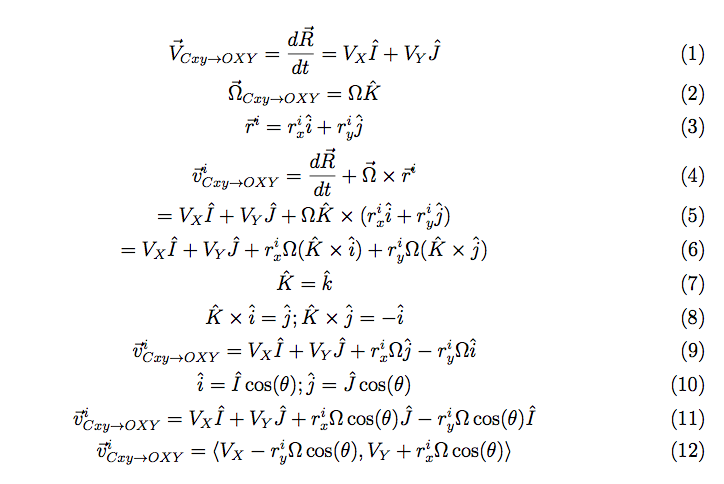 MATLAB was used to verify the equations. 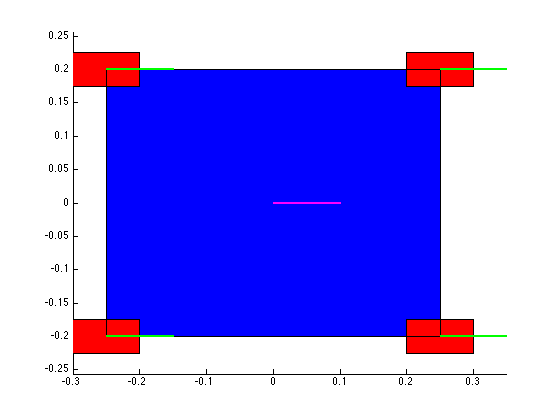 Simple inputs were sent to the equations and various outputs were plotted for evaluation. 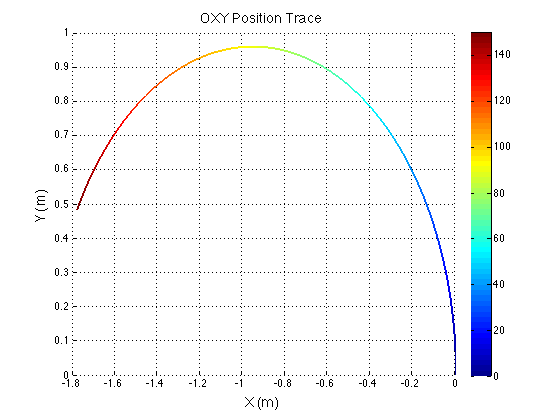 The rainbow plots show the physical path of the robot in the XY plane. The color indicates the angle of rotation in degrees. The last graph shows my original eureka moment when I finally realized I fixed the problem. Previously, there was a cusp in the magnitude of velocity when it should have been constant. When I saw the constant red line, I knew I was on the right track. Because the control inputs are centered to the robot's frame, if you hold constant translational inputs with a rotation, the robot will end up taking a curved path. 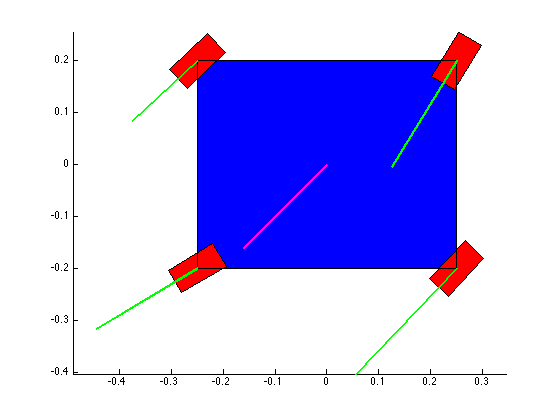 However if you hold constant translational inputs with no rotation, the robot will travel straight. This is shown by the graphs with no color change. Rendering of the detailed assembly. Bearings and fasteners have been specced. 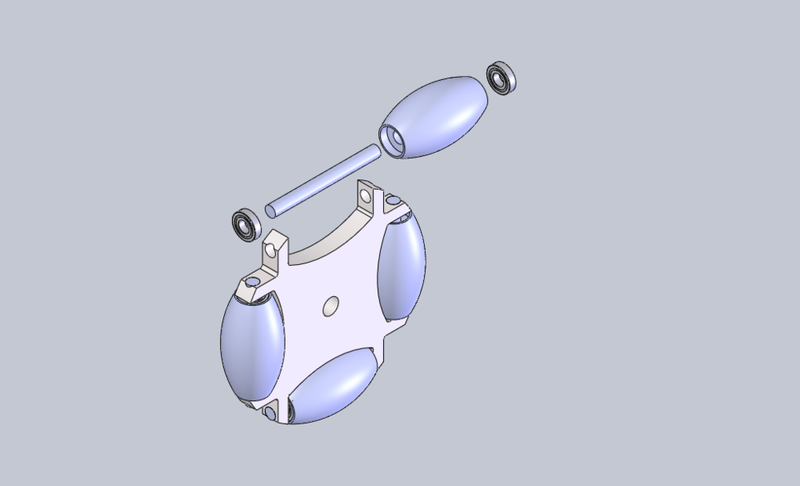 Currently working on a high load capacity omniwheel design for our circuit breaker removal robot (BreakerBot). Off the shelf omniwheels of this load capacity (750lb) are very expensive! This design is an exercise to see if constructing our own wheels is a feasible solution. Our other options are to choose an alternative drive train system that doesn't require these expensive and complex omniwheels. However, those systems are either non-holonomic (ackerman steering) or even more complex (swerve drive). I am hoping that we will be able to use these wheels with sort of H-drive system. 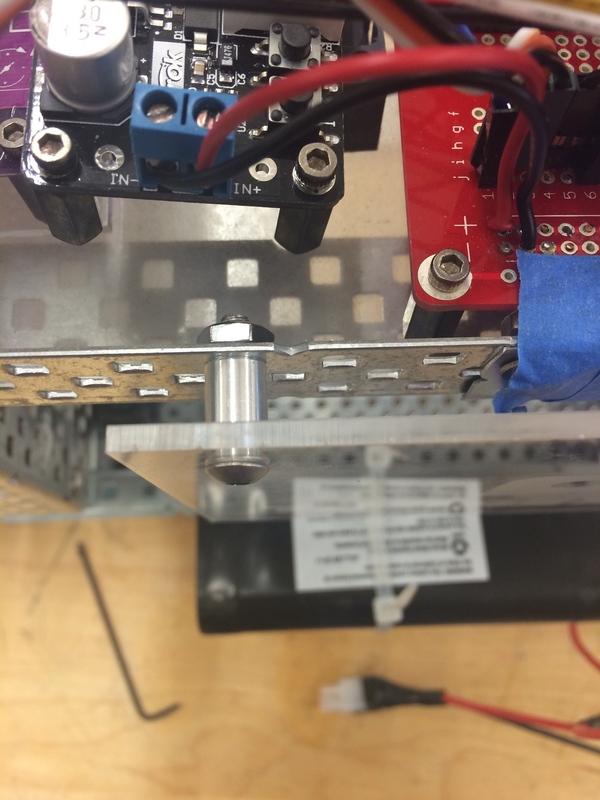 We do not need full holonomic control, but the ability to strafe and turn on a point would be very useful for aligning the robot with the breaker's cubicle for extraction.